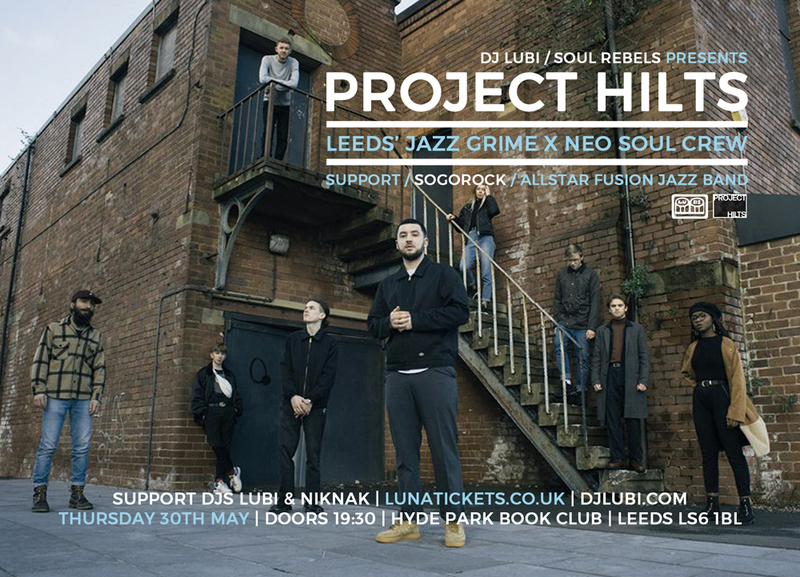 Since their packed debut gig at RE:SOUL back in October 2019, Project Hilts have made a big spalsh in the vibrant Leeds jazz/soul/hip-hop scene. Coming from Leeds College Of Music, they are led by London rapper Hilts (Danny Hilton), a veteran of the London grime scene. Hilts came to Leeds to study production after getting tired of making beats in his bedroom on his laptop. Once at the college of music, he teamed up with some great young musicians and singers there to form an 8 piece live band that brings together jazz and grime with hip-hop, soul and Latin beats. Since the debut show, they’ve played a support slot to Tetes De Pois at Soul Rebels at The Wardrobe, made their first video courtesy of Tight Lines and played their debut London show. Now they step it up with their first headline show in Leeds at Hyde Park Book Club. That basement space will be rocking to the jazz grime beat for sure. Come and get a taste. SogoRock are a Leeds-based band formed in 2018 by two Hungarian brothers studying at Leeds College Of Music, Bela Horvath Jr and Laky Franz. The band has 6 members (4 current students at Leeds College Of Music and 2 alumni musicians), who bring together their musical loves – jazz, funk, r’n’b, rock, Caribbean music, pop, gospel, electronica, Hungarian folk – into a unique “no borders” global music fusion sound. The band are : Bela Horvath Jr (piano and keyboard), Laky Franz (keyboard and talk box), Josh Gumbs (drums), Reverend Beanz (electric bass), Nik Svarc (guitars) and Matt Hines (saxophone/electronics). They are starting to gig out around Leeds. Come and check them out. Something really different from the jazz/soul/global beats scene of Leeds. DJs on the night are Lubi (Soul Rebels Sessions/RE:SOUL/KMAH Radio) and special guest DJ NikNak (BBC Radio Leeds). NikNak is one of Leeds’ most open minded DJs whose roots are hip-hop – she’s a great scratch DJ – but she also bosses of so many other genres, from jazz to dubstep, house to soul, reggae to Brazilian beats. A producer in her own right, she often guests on live gigs as a turntablist with Leeds bands Necktr and TC & The Groove Family. Check her weekly show “BackStage” on Wednesdays 7.00pm on BBC Radio Leeds. Doors 7.30pm. SogoRock 8.15pm. Project Hilts 9.30pm. DJs Lubi and NikNak before, between and after live sets.